This is the fourteenth book in the Tarzan Series. Tarzan, his monkey friend Nkima, and Chief Muviro and his faithful Waziri warriors prevent Soviet communists from looting the lost city of Opar. 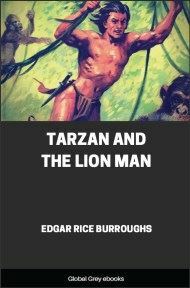 The story also prominently features Tarzan's lion ally Jad-bal-ja. This book marks the last appearance of Opar and La in the Tarzan series, aside from the juvenile piece Tarzan and the Tarzan Twins with Jad-Bal-Ja the Golden Lion, which was published later but is chronologically earlier. I AM no historian, no chronicler of facts, and, furthermore, I hold a very definite conviction that there are certain subjects which fiction writers should leave alone, foremost among which are politics and religion. However, it seems to me not unethical to pirate an idea occasionally from one or the other, provided that the subject be handled in such a way as to impart a definite impression of fictionizing. Had the story that I am about to tell you broken in the newspapers of two certain European powers, it might have precipitated another and a more terrible world war. But with that I am not particularly concerned. What interests me is that it is a good story that is particularly well adapted to my requirements through the fact that Tarzan of the Apes was intimately connected with many of its most thrilling episodes. I am not going to bore you with dry political history, so do not tax your intellect needlessly by attempting to decode such fictitious names as I may use in describing certain people and places, which, it seems to me, to the best interest of peace and disarmament, should remain incognito. Take the story simply as another Tarzan story, in which, it is hoped, you will find entertainment and relaxation. If you find food for thought in it, so much the better. Doubtless, very few of you saw, and still fewer will remember having seen, a news dispatch that appeared inconspicuously in the papers some time since, reporting a rumor that French Colonial Troops stationed in Somaliland, on the northeast coast of Africa, had invaded an Italian African colony. Back of that news item is a story of conspiracy, intrigue, adventure and love—a story of scoundrels and of fools, of brave men, of beautiful women, a story of the beasts of the forest and the jungle. If there were few who saw the newspaper account of the invasion of Italian Somaliland upon the northeast coast of Africa, it is equally a fact that none of you saw a harrowing incident that occurred in the interior some time previous to this affair. That it could possibly have any connection whatsoever with European international intrigue, or with the fate of nations, seems not even remotely possible, for it was only a very little monkey fleeing through the tree tops and screaming in terror. It was little Nkima, and pursuing him was a large, rude monkey—a much larger monkey than little Nkima. Fortunately for the peace of Europe and the world, the speed of the pursuer was in no sense proportionate to his unpleasant disposition, and so Nkima escaped him, but for long after the larger monkey had given up the chase, the smaller one continued to flee through the tree tops, screeching at the top of his shrill little voice, for terror and flight were the two major activities of little Nkima. Perhaps it was fatigue, but more likely it was a caterpillar or a bird's nest that eventually terminated Nkima's flight and left him scolding and chattering upon a swaying bough, far above the floor of the jungle. The world into which little Nkima had been born seemed a very terrible world, indeed, and he spent most of his waking hours scolding about it, in which respect he was quite as human as he was simian. It seemed to little Nkima that the world was populated with large, fierce creatures that liked monkey meat. There were Numa, the lion, and Sheeta, the panther, and Histah, the snake—a triumvirate that rendered unsafe his entire world from the loftiest tree top to the ground. And then there were the great apes, and the lesser apes, and the baboons, and countless species of monkeys, all of which God had made larger than He had made little Nkima, and all of which seemed to harbor a grudge against him. Take, for example, the rude creature which had just been pursuing him. Little Nkima had done nothing more than throw a stick at him while he was asleep in the crotch of a tree, and just for that he had pursued little Nkima with unquestionable homicidal intent—I use the word without purposing any reflection upon Nkima. It had never occurred to Nkima, as it never seems to occur to some people, that, like beauty, a sense of humor may sometimes be fatal. Brooding upon the injustices of life, little Nkima was very sad. But there was another and more poignant cause of sadness that depressed his little heart. Many, many moons ago his master had gone away and left him. True, he had left him in a nice, comfortable home with kind people who fed him, but little Nkima missed the great Tarmangani, whose naked shoulder was the one harbor of refuge from which he could with perfect impunity hurl insults at the world. 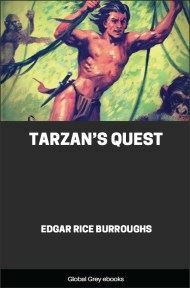 For a long time now little Nkima had braved the dangers of the forest and the jungle in search of his beloved Tarzan. Because hearts are measured by content of love and loyalty, rather than by diameters in inches, the heart of little Nkima was very large so large that the average human being could hide his own heart and himself, as well, behind it and for a long time it had been just one great ache in his diminutive breast. But fortunately for the little Manu his mind was so ordered that it might easily be distracted even from a great sorrow. A butterfly or a luscious grub might suddenly claim his attention from the depths of brooding, which was well, since otherwise he might have grieved himself to death. And now, therefore, as his melancholy thoughts returned to contemplation of his loss, their trend was suddenly altered by the shifting of a jungle breeze that brought to his keen ears a sound that was not primarily of the jungle sounds that were a part of his hereditary instincts. It was a discord. And what is it that brings discord into the jungle as well as into every elsewhere that it enters? Man. It was the voices of men that Nkima heard.